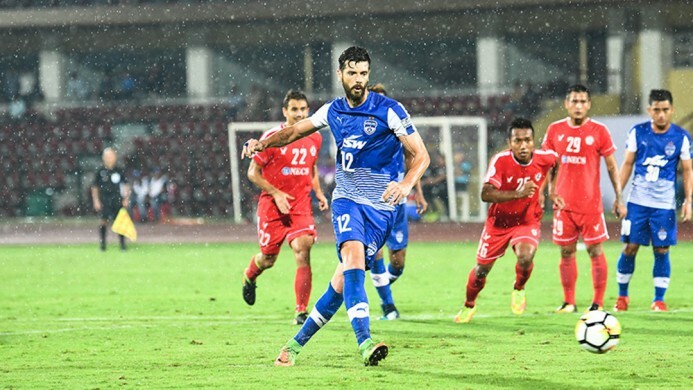 Goals from Daniel Segovia (45+1’), Rahul Bheke (63’) and Daniel Lalhlimpuia (77’) ensured Bengaluru FC maintained their perfect start to their Group E campaign of the AFC Cup with a 3-1 win over Aizawl FC at the Indira Gandhi Stadium, in Guwahati, on Thursday. Trailing after an early setback, Albert Roca’s boys kept their calm and went about staging an assured comeback that now sees them with six points from two games. The Spaniard underlined the faith he had in the squad that has been getting more than just the job done for the Blues in this season’s continental campaign so far, by naming Sunil Chhetri, Gurpreet Singh and Udanta Singh among others, on the bench. The Blues got off to a poor start under the rain conceding inside five minutes. Skipper Lalthuammawia Ralte, who rushed ahead to clear a through pass from Andrei Ionescu aimed at attacker Albert Zohmingmawia, found his effort come off striker Leonce Dodoz (5’) and roll into an empty net to give the hosts an early lead. While Aizawl opted to protect their lead by sitting back, the next forty minutes saw Bengaluru press and dominate proceedings spare the odd attack on the counter from the hosts. The Blues finally made the huge chunk of possession count at the stroke of half time. Erik Paartalu’s header from a Bengaluru corner caught the hand of Dodoz in the box and the referee pointed to the spot. Segovia stepped up to calmly slot home his first goal since joining the club in the middle of the season, to make it 1-1. Bengaluru and Segovia had a big chance to score a second minutes into the start of the second half, but the striker fluffed his lines from the spot after Subhasish Bose was brought down in the box. Segovia sent Avilash Paul the wrong way only to see his take come off the post and roll out. But the Blues refused to let the miss dampen their chase for the lead and their wait wasn’t too long before they got the goal to send them ahead. A corner played short saw Alwyn George lose a man before sending in a cross that Bheke did well to nod home in the 63rd minute. 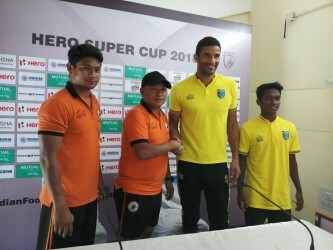 Second half substitute Lalhlimpuia who scored the winner in the Blues’ Group E opener against Abahani Dhaka Limited, got his second of the campaign in the 77th minute. Setting off on a run down the left with the ball, Bose squared the ball perfectly for Lalhlimpuia who took a touch before slotting past Paul who could maybe have done better to keep it out. Lalhlimpuia could have got his second of the night after some fantastic work by George saw him tee up the striker. But this time, Paul got enough of a hand on the ball to keep it out. Bengaluru now host Maldivian side New Radiant SC at the Sree Kanteerava Stadium on April 10.